Changes to bus routes subsidised by Kent County Council will come into effect on April 7. The changes were agreed to save the authority some £360,000. Most bus routes in Thanet are operated by Stagecoach on a commercial basis without any funding from the council. But KCC has funded the operation of some services which, while not commercially viable, have been considered important to the local community. At the end of last year KCC launched a consultation on proposals to withdraw funding for some of the council supported bus routes in the area. Stagecoach was asked if it could make changes to its existing bus network to help with routes in areas affected by the loss of council funded services. The decision affects services including the 42/42A, 56 and 39/39A. The withdrawn routes will be replaced with new services and changes to existing commercial services along most sections, says Kent County Council. Ward councillor Jenny Matterface, who campaigned against the service cuts, said: “Beacon Road area residents who use the 33 that was a poor replacement for the 8A now only have one bus an hour that has merged with the 38 with a gap mid-afternoon. Some Monday to Saturday morning bus times will be adjusted. Sunday and Bank Holiday bus times remain unchanged. Some bus times will change. All route 9 buses will serve Minster and Monkton. They will also serve the Tesco Extra on the way out towards Broadstairs. Peak-time route 9X buses will continue to run a direct service to and from Canterbury (not serving Minster or Monkton). There will be a new evening route 9X bus from Canterbury to Ramsgate at 1910. This route will be altered and extended to cover sections that are currently served by KCC route 38 in the east of Thanet. Route 33 will continue to run an hourly daytime service through Margate, Kingsgate and Broadstairs but will be rerouted to include Eastern Esplanade, Palm Bay Avenue and Northdown Park. After Broadstairs the route will extend to serve East Dumpton and Ramsgate Harbour. This route will remain unchanged (except that in Minnis Bay buses will run along Dane Road instead of Arthur Road). Most bus times will be different. This is a new bus route that will replace most sections that are covered by the existing KCC route 56. New route 37 will run during the daytime on Mondays to Saturdays, serving Stanley Road and Lanthorne Road, Broadstairs, St Peter’s Surgery, Rumfields, Westwood Cross, Asda (Westwood Road) and then St Peter’s Road to and from Margate. These KCC routes will be replaced by route 33 in east Thanet and by new route 48 in west Thanet (between Birchington and Ramsgate). This route will be replaced by nearby alternative options on existing Stagecoach bus routes. A new route 48 will replace the service in Sherwood Gardens and Dumpton, offering a Monday to Saturday daytime link to Ramsgate. This morning and evening service will no longer operate. KCC route 42 will be replaced by route 9 in Monkton and Minster and new route 45 in Ramsgate and the Nethercourt Estate. Cliffsend will have access to the new 45 service on Sandwich Road. Route 42A will no longer operate, but new arrangements will be available using school-time routes 943 for Minster and Monkton and routes 942 and 944 for Cliffsend. This route will no longer extend into Thanet. Buses will run between Sandwich and Canterbury with one bus an hour extending to Discovery Park. A new route 45 will operate between Ramsgate and Sandwich via Discovery Park. Some Monday to Saturday bus times will change. Sunday and Bank Holiday bus times will remain the same. This new route will replace the existing 43 service between Ramsgate and Sandwich. It also replaces the existing KCC route 42 service in Ramsgate and the Nethercourt Estate. Route 45/45A will run hourly throughout the day on Mondays to Saturdays. This new route will replace the existing KCC route 38 and 38A in the west of Thanet (Birchington, Acol, Manston, St Lawrence and Ramsgate). It will also extend to Dumpton replacing the existing KCC route 39 in that area. The existing route 38A journeys will be renumbered 48A (some bus times will change slightly). This KCC bus route will be largely replaced by a new route 37. Route 37 will run during the daytime on Mondays to Saturdays, serving Stanley Road and Lanthorne Road, Broadstairs, St Peter’s Surgery, Rumfields, Westwood Cross, Asda (Westwood Road) and then St Peter’s Road to and from Margate. Some bus times will be adjusted to help improve the reliability of the service. Printed timetable leaflets will be available on buses and from local outlets by 30 March. From the 23 April, after the Easter holiday when the schools go back, there will be some changes to school-time bus routes and timetables. • An extra route 932 bus will operate from Margate to Minnis Bay via Hartsdown Academy in the morning. • The existing morning and afternoon journeys will be retimed to better suit the start and finish times at King Ethelbert School and Ursuline College. • The morning bus from Kingsgate through Broadstairs, Ramsgate and Newington to Dane Court School will be retimed slightly to improve punctuality. • The 1438 bus from St George’s School to Newington, Ramsgate and Dumpton will be slightly retimed to improve timekeeping. • The afternoon bus from Charles Dickens School to Newington and Ramsgate will no longer operate. An alternative bus is available on route 34 from Westwood Road at 1531. • The morning journey that starts from Cliffsend at 0710 will begin 9 minutes earlier at 0701 and run several minutes earlier through Minster, Acol, Birchington, Minnis Bay, Westgate, Garlinge, Margate to arrive more punctually at Dane Court and St George’s Schools. • The morning journey from Minster will depart 14 minutes earlier at 0716 and run several minutes earlier through Monkton, St Nicholas, Birchington, Westgate and Hartsdown College in order to arrive more punctually at Dane Court and St George’s Schools. • This morning bus will be replaced by a route 8X bus from Birchington Square at 0737 running direct to Margate and then Dane Court and St George’s Schools. • The morning route 948 short journey from Margate to St George’s School will no longer operate. An alternative service is provided using the new 8X bus from Margate Council Offices at 0756. • The morning bus from The Wheatsheaf towards Margate will depart 9 minutes earlier at 0740. This is so the bus can arrive more punctually at Dane Court and St George’s Schools. • The morning bus from Minnis Bay will depart 8 minutes earlier at 0709 and run a few minutes earlier through Birchington and Westgate to Margate. These are serious cuts imposed despite all the excuses. Don’t vote for the people who supported these! Discrimination? Oh please. Anything that happens these days and the first thing people shout is discrimination! I understand both sides of the petition. However, why should KCC fund a bus service route that is not making profit, does not make any money and looses them in excess of £100,000 every year? Theres other transportation services available. It’s maybe unfair but in no way discrimination. People in millmead will still be able to get to WWX regardless and most of Broadstairs and St. Peters is still being served. Again I understand, but you have to look at the point KCC is making as well. It’s called “cross subsidisation” – Stagecoach make huge profits out of running some bus routes but are allowed to “cherry pick” which ones that lose money and close them. Time is long overdue to return all Kent’s bus services to public ownership and stop the rip-offs! So Stagecoach should be expected to run a service that is loss making? Wouldn’t want you running my business! Because these are public services vital to the community. I wouldn’t want to run the sort of business you espouse. The Royal Mail handles millions of letters – the ones from the Scilly Isles to the Shetlands probably cost three quid each. Ones can be delivered from one London Borough to another for ten pence a go – one subsidises the other. Simple principle of public service – time we scrapped having cowboy contractors running services millions of people rely on and return to an ethos of supporting our elderly, disabled and three quarters of households that don’t own cars! Bottom line is you’re wrong and you can’t compare those two. The same principal applied when the services was run by Eastonways, Carol Peters etc. It’s loss making and does not in anyway have near the amount of footfall it requires to be substantially viable. Your idea that KCC continues to plow money into a loss making service is quite frankly, absurd. If you genuinely believe that’s the case then get rid of the bus pass and have everybody pay the bus fare. Alternatively, cut the timing and remove some of the route, or use other transport options. Thank goodness that no everyone has your approach to running services. Not everything is run in order to make a profit, though successive recent governments have tried to make it so. Some things are run by the community for the good of the community. Education. Health. Infrastructure. And public transport should certainly be there with the rest. There’s more to it than pure profit. A bus route might make a loss on paper, but if most of the people travelling by bus had to use cars instead, roads would be more congested and pollution would rise. Those having no access to a car would not be able to get to hospital and doctor’s appointments, inevitably leading to an increased burden on the NHS in the longer term. If everything has to be driven by profit, then shouldn’t motorists have to pay the true cost of driving on the roads? Mr N Name: what a callous person you seem to be. In a society, we all contribute as individuals for services and facilities that we, as individuals, don’t necessarily directly use, but society ad a whole does. Why not go and live on an island on your own somewhere. Then you wouldn’t have to pay for anything you didn’t want. Nor, of course, would you get anything you hadn’t personally paid for. How many of you replying use a bus pass? All of you I would think. There are strong moral reasons why KCC should fund bus services. It seems that Ms/Mr No Name is not aware of this. I use a bus pass but I also pay income tax and council tax so why ‘point proven’? I don’t understand the “point proven” comment, either. Is Mr(Mrs/Ms/Miss etc) Noname suggesting that pensioners who use a bus pass are getting something for nothing? We get a pension because throughout our working lives we pay into pension schemes of one sort or another. A pension is a right, not a “benefit”. In the same way, people have (and still do, even pensioners) pay Council Tax, part of which goes to pay for freedom passes and the like. As was said earlier: if you don’t want to enjoy the benefits of society (and the consequent duties) then go and live somewhere where there is no society. Well said May – this is what really happened. Doesn’t the 34 still cover this? Number 34 only serves Dane Court Road and Westwood Road in Broadstairs so not much use if you live in the Chessboard area without a car and relying on your local bus so you can get out and about enjoying a. social life. In my ward resident ets who live like me on Beacon Road who aren’t able to walk to the Loop rely on the 33 just to get anywhere. These cuts are typical of the Tories’ attitude to public services. 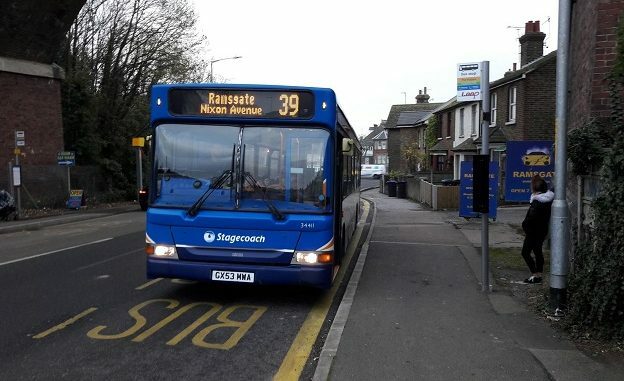 WE RELY ON THE 39 ROUTE TO RAMSGATE & TO ASDAS IN BROADSTAIRS. AS WE ARE DISALB. Another loss to our precarious way of life, dressed up as “necessary” because of the need to “save money”. Hospitals, schools, buses, trains all worsening. Why complain about the EU destroying our “British way of life” when British businessmen and Tory politicians are doing that very thing and getting away with it? In reply to No Name’s 9.01 posting, I don’t know what he/she means by “Point proven”. Can we have an explanation, please? The bus routes that make a surplus are the ones that run regularly. Few people will wait an hour for a bus that may not even turn up! Look at the history of the London tube- 30 or 40 years ago it was dirty, infrequent and had old rolling stock. People were abandoning it in droves. Once fares were cut, services improved and investment made it turned around completely and is now packed, even at 2-00 a.m. You either run transport as a public service or it will fade away. No room for private contractors creaming off profits and running worse services year on year. All this disruption for 360k? Absolutely bizarre and I agree entirely with the comments about what a public service should be. Some profit make other are subsidised. To cut routes where most impact is on older people or disabled people is absolutely discrimination. Shame on KCC for not being a bit more creative and saving 360k somewhere else. I suggest the 20m they want to invest in Thanet Parkway station in the middle of nowhere for starters. £20M? We could have luxury air-conditioned executive coaches for that money! This is not the first time that Thanet has copped it from County Hall in Maidstone. I am not aware of any other area of Kent that is receiving such severe cuts to their Council supported bus services. We are definitely the poor relation. Emmeline and Mike are right to highlight the nonsense about a station at Cliffsend. The locals there don’t want it spoiling their village, there is a perfectly good station up the line at Minster that could be upgraded and it saves one minute going from there whilst adding two minutes on to journeys from Ramsgate, Broadstairs and Margate. Of course TDC leadership will say it is “capital” and not revenue expenditure – but borrowing two million quid from the PWLB will require revenue repayments of around £150,000 a year. Would rather save the 56 and reinstate the full 8A route with that, as well as the other routes in Thanet! Cliffsend Station always looked a bit dodgy – anyone know what was behind that?